PHOENIX -- Sen. John McCain's packed agenda while on break from Congress in his home state of Arizona has hardly been the schedule of a typical brain cancer patient - or even someone about to turn 81. "His resilience & strength is incredible," she wrote. "Fight goes on, here's to small wins." "This is all so characteristic of him, going back to his early days in Arizona politics," said Grant Woods, the state's former attorney general who served as McCain's administrative assistant while he campaigned in 1982 for a seat in Congress' lower house. "He outworked everyone, went door-to-door all summer in 110 temperatures." Still, during McCain's time in Arizona, tensions have increased with Trump, who recently criticized the senator again for voting against the GOP health-care bill he backed. "You mean Senator McCain, who voted against us getting good health care?" Trump asked when his name came up during a news conference. Trump's remark came a day after McCain criticized him for saying both the white nationalists and counterprotesters bear responsibility for the violence last weekend in Charlottesville, Virginia. The senator insisted in a tweet that "there's no moral equivalency between racists & Americans standing up to defy hate and bigotry" and the president should say so. Trump also has sharpened his criticism of McCain's fellow Arizona Republican Sen. Jeff Flake in the lead-up to a Tuesday night rally Trump has planned in Phoenix, calling the senator "WEAK" on the border and crime. "They experience a lot of relief from the problems the tumor caused," such as headaches or seizures from pressure on the brain. Patients usually do well in the early post-operative stage, Lawton said. "But there could be some tough things down the road," he added, speaking generally about typical experiences with glioblastoma because Barrow is not involved in McCain's treatment. McCain's three-week round of treatments that ended Friday forced the globe-trotter to stay near home rather than travel to meet with troops or international leaders as he normally does each August. The senator said during his Facebook appearance that after this round, doctors will "see if there is anything additional that needs to be done." In the meantime, "I feel good. I have plenty of energy." McCain warned friends and foes with a laugh: "I'm coming back!" In a widely praised speech, McCain complained to his fellow senators they had been "getting nothing done" because of partisanship and called the U.S. health care system a "mess." He then cast a thumbs-down vote against the latest attempt to repeal and replace Obamacare, winning praise from Democrats and scorn from the right. 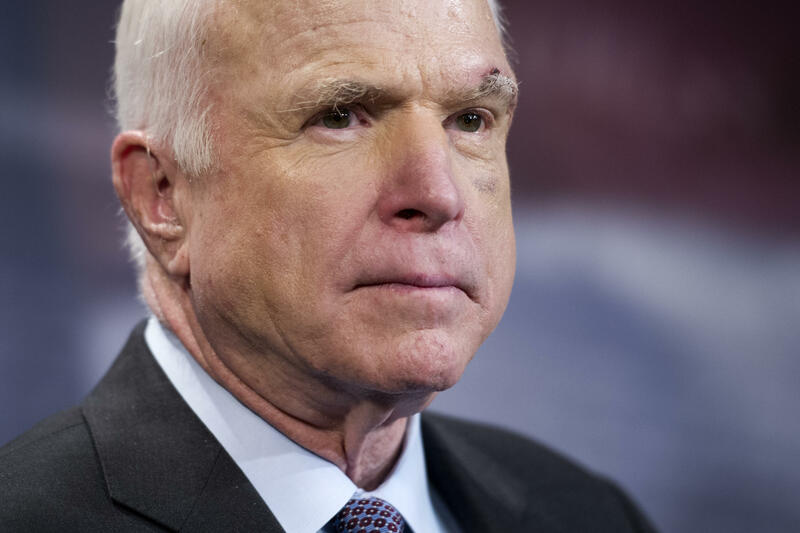 Michael O'Neil, an Arizona pollster who writes a political column and has a local radio show, said facing such a serious illness will likely bring McCain even greater freedom to act on his beliefs. "All the political constraints are now gone," he said. "Even those that want me to die don't want me to die right away," he said during his Facebook appearance. "Thank you for everything you've done for literally the luckiest guy on Earth."